--La Foret is a non-profit conference and retreat center, and much more. La Foret is situated on 400 beautifully, wooded acres in the heart of Black Forest, Colorado. We have multiple meeting halls, a chapel, nine cabins, a yurt village, an outdoor swimming pool, a ropes course, great hiking trails, sand volleyball, tennis, basketball, horseshoes, gaga ball, etc. We can accommodate groups for corporate meetings, retreats, weddings, family reunions, school outings and ropes course initiatives. Is La Foret religious? 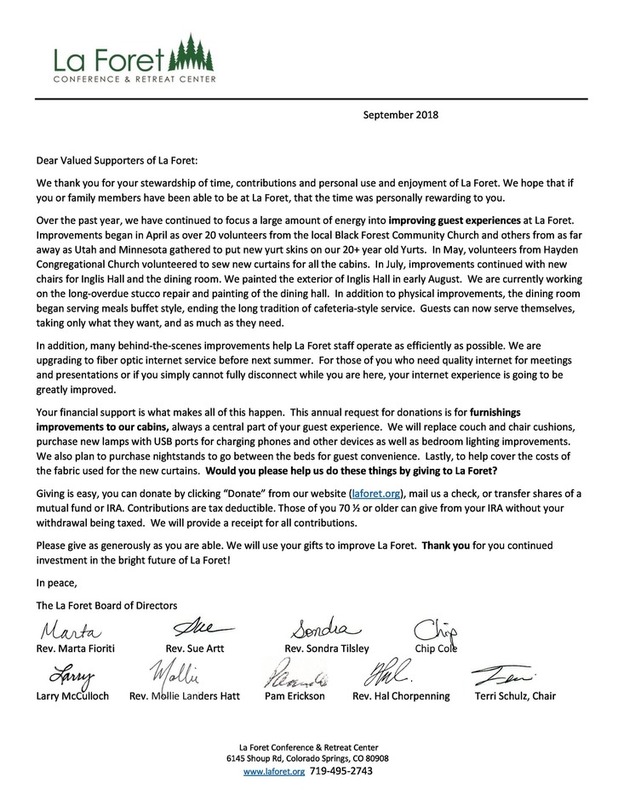 Does La Foret require groups to be of a particular denomination? --Although La Foret is owned by the Rocky Mountain Conference United Church of Christ. No affiliation is required to use this great facility. Everyone is welcome at La Foret. We provide sanctuary for all to consider the transcendent issues of life. Can my family rent a cabin for a weekend? --Families are welcome to rent cabins at La Foret. Our cabins sleep between ten and twenty people, and are equipped with bunk beds. We require at least twenty people to open our dining hall for meals, unless we are already serving other groups. Two of our cabins have full household kitchens. One sleeps eleven and the other sleeps eighteen. Small groups that rent our cabins with kitchens are able to be self-contained and cook their own meals. Does La Foret allow tent camping throughout the woods? --Group tent camping is only allowed in designated areas. This typically entails renting our yurt village, which has its own bathhouse and fire circle. It also includes use of the Ben Smith Stables. We are not a campground, so we cannot accommodate individuals just looking for a weekend getaway. Do you require a deposit upon booking? --A 20% down payment is due two weeks after the contract is issued. The 80% balance is due two weeks prior to the event. We contract based on minimum numbers, so if you exceed your contracted minimum, we will issue a final invoice, which reflects your actual count for meals and for lodging. Can your kitchen accommodate our group’s dietary restrictions? --We will cater to all serious food allergies by offering them an alternate choice, and will cook their food separately to avoid cross contamination when necessary. Dietary preferences will be honored when possible. In addition to our hot meal, we provide fruits, yogurts, oatmeal and cereal with every breakfast, and a large salad bar with every lunch and dinner. --If a group cancels at least 60 days prior to their event, 5% of the contracted amount may be forfeited. We will refund 15% of the down payment. If the group rebooks for a different date, we are able to transfer the entire 20% to the new retreat. If a group does not give at least a 60-day cancellation notice, they may be liable for the entire contracted amount. Extreme emergencies may be given leniency. Do you offer discounts for non-profits or repeat users? --We are unable to offer discounts to non-profit groups or repeat users. The majority of our guests fall under the non-profit category. We are able to offer discounts to school groups that come mid-week and eat their meals in our dining hall. Since we are owned by the United Church of Christ, we also offer discounts to UCC members. This does not apply to weddings. Is La Foret open to the public? --La Foret is not open to the public. Although everyone is welcome at La Foret, guests must be contracted to be on site. We are under strict child-care licensing rules, which we must follow. How can I volunteer at La Foret? --Prearranged work groups are welcome to come to La Foret to help with fire mitigation, trail maintenance, etc. Volunteers working in other capacities are first required to complete a background check. Are prices different during certain parts of the year? Do you have off-season rates? --Our prices for meals and for lodging do not vary throughout the year. We offer off-season rates for weddings from November 1 st through April 30th . Do I need to bring my own bedding? --Linens can be provided at the rate of $15.00 per person. Our linen set includes mattress pad, sheet set, pillow, blankets and a towel. Many of our guests bring their own sleeping bag/bedding, pillow and towel. You will also need to provide your own personal toiletry items. --Unfortunately, only licensed service animals are allowed at La Foret. Did any of La Foret burn in the Black Forest Fire of 2013? --We are very lucky that firefighters worked so hard to save our property and buildings, as well as many other important community spaces. No, thankfully our land did not experience any of the major wildfire that year. How long has La Foret been a camp? --Since Alice Bemis Taylor's death in 1942, when La Foret was deeded to the UCC. Cabins were added to the property, and the church used La Foret for their outdoor ministries. Over the years La Foret has developed into a full-service conference and retreat center, and presently, La Foret is doing better than it's ever done before! How do I sign my kids up for summer camp? --Summer camp is available through several different hosts, as well as La Foret's own camp. On the Summer Camp page, you can find details and links to additional websites for easy, online registration.